Applications and services may publish status information that management systems can receive to monitor the status of the device. For example, a bundle could publish Status Variables for a number key VM variables like the amount of available memory, battery power, number of SMSs sent, etc. Status Variables can be used in performance management, fault management as well as in customer relations management systems. This specification outlines how a bundle can publish Status Variables and how administrative bundles can discover Status Variables as well as read and reset their values. Status Variable - Application specific variables that a Status Variable Provider publishes with a Monitorable service to the Monitor Admin service. Status Variable values can be long, double, boolean or String objects. Status Variable Provider - A bundle which has a number of Status Variables that it publishes with one or more Monitorable services. Monitor Admin - Provides unified and secure access to available Status Variables as well as providing a function to create monitoring jobs to monitor the Status Variables. Monitorable - A service that is registered by a Status Variable Provider to publish its Status Variables. Monitor Job - An event or time based query of a given set of Status Variables. When a monitored Status Variable is updated, or the timer expires, the Monitor Admin must generate an event via the Event Admin service. Local Administrator - A management application which uses the Monitor Admin service to query Status Variables and to initiate monitoring jobs. Status Variable Name - The unique name, within a Monitorable service, of a Status Variable. Status Variable Path - A string that uniquely identifies the Status Variable in an OSGi environment. It consists of the PID of the Monitorable service and the Status Variable name separated by a solidus ('/' \u002F). A bundle that provides a Status Variable must register a Monitorable service. This service is used by the Monitor Admin to get Status Variables and provide meta information to clients. Clients can use the Monitor Admin to obtain Status Variables in a protected way. Clients can also create Monitoring Jobs. These Monitoring Jobs send out notifications to the clients when the value changes or periodically. A Status Variable is a simple scalar that represents some key indicator of the environment, for example amount of available memory. Status Variables are further discussed in Status Variable. The length of this PID must fit in 32 bytes when UTF-8 encoded. Monitorable services are tracked by the Monitor Admin service. The Monitor Admin service can provide the local administrator unified access to all the Status Variables in the system. This is depicted in Figure 119.2. The main responsibility of a Monitorable service is therefore to provide access to its own Status Variables as well as providing information about those Status Variables. getStatusVariableNames() - Provides a list of the Status Variable names. The status variables can subsequently be acquired with the getStatusVariable(String) method. getStatusVariable(String) - Given the name of a Status Variable, return the StatusVariable object, if exists. resetStatusVariable(String) - Reset the given Status Variable if there is a reasonable reset value. If the Status Variable could not be reset, false is returned. Otherwise true is returned. Resetting a Status Variable triggers a Monitor Event, as described in Monitoring events. notifiesOnChange(String) - Tells whether the given Status Variable sends a notification when its value changes or when it is reset. This is further discussed in Providing Notifications. getDescription(String) - Provide a non-localized description of the given Status Variable. If a Monitorable service returns true for the notifiesOnChange(String) method then it must notify all Monitor Listener services when the related Status Variable changes. These Status Variables are called dynamic Status Variables. After the value of a dynamic Status Variable is changed, the Monitorable service must get the singleton Monitor Listener service and call the updated(String,StatusVariable) method. The Monitor Admin service must use this notification mechanism to send out a generic event via the Event Admin service, as described in Monitoring events. The Monitor Admin can also use this information to signal a remote server in a proprietary way. Figure 119.3 shows a sequence diagram for such an update. This indirection is required for security reasons. The following code shows how a bundle could provide a Status Variable that contains the current amount of memory. A Status Variable is a simple value that is published from a Monitorable service. A Status Variable has a name, a value, a timestamp, and a collection method. Additionally, the Monitorable service that publishes the Status Variable can be used to reset the Status Variable and provide a description of it. The OSGi Specification provides an implementation class for a Status Variable. This class is final and immutable, it must be treated as a value. The length must be limited to 32 characters in UTF-8 encoded form. It must be unique in the scope of the Monitorable service. TYPE_BOOLEAN - A boolean value. The associated method to retrieve the value is getBoolean(). The corresponding constructor is StatusVariable(String,int,boolean). TYPE_INTEGER - A signed numeric value that fits in a Java int type. The associated method to retrieve the value is getInteger(). The corresponding constructor is StatusVariable(String,int,int). TYPE_FLOAT - A floating point value that fits in a Java float type. The associated method to retrieve the value is getFloat(). The corresponding constructor is StatusVariable(String,int,float). If a method is called that does not match the return value of the getType() method, the Status Variable must throw an Illegal State Exception. The time stamp must reflect the time that the measurement was taken from the standard Java System.currentTimeMillis method. The time stamp can be obtained with the getTimeStamp() method. This specification is compatible with terminology used in  ETSI Performance Management [TS 132 403]. An important concept of a Status Variable is the way it was collected, this is called the collection method. The collection method is independent of how (if and when) the reporting of the Status Variables happens. The collection method is part of the Status Variable's definition and cannot be changed. The collection method of a Status Variable can be obtained with the getCollectionMethod() method. CM_CC - A numeric counter whose value can only increase, except when the Status Variable is reset. An example of a CC is a variable which stores the number of incoming SMSs handled by the protocol driver since it was started or reset. CM_GAUGE - A numeric counter whose value can vary up or down. An example of a GAUGE is a variable which stores the current battery level percentage. The value of the Status Variable must be the absolute value not a difference. CM_DER - (Discrete Event Registration) A status variable (numeric or string) which can change when a certain event happens in the system one or more times. The event which fires the change of the Status Variable is typically some event like the arrival of an SMS. The definition of a DER counter contains an integer N which means how many events it takes for the counter to change its value. The most usual value for N is 1, but if N is greater than 1 then it means that the variable changes after each Nth event. CM_SI - (Status Inspect) The most general status variable which can be a string or numeric. An example of an SI is a string variable which contains the name of the currently logged in user. The Monitor Admin service is a singleton service that provides unified access to the Status Variables in the system. It provides security checking, resolution of the Status Variable paths and scheduling of periodic or event based Monitoring Jobs. The Monitor Admin manages the status variables from any registered Monitorable services. The Monitorable services can be discovered using the getMonitorableNames() method. This returns a sorted list of PIDs, potentially empty. This list can contain the PIDs of Monitorable services where the caller has no access to any of its Status Variables. getStatusVariableNames(String) - Returns the Status Variable names given the PID of a Monitorable service. getStatusVariables(String) - Returns an array of Status Variable objects given the PID of a Monitorable service. resetStatusVariable(String) - Reset the value of a Status Variable. The Monitor Admin service finds the associated Monitorable service by looking for a Monitorable service with the given PID (com.acme.foo). It will then query the Monitorable service for the Status Variable memory.free, which is then subsequently returned to the caller. The use of wildcards is the same as described in Monitor Permission The Monitor Admin service must expand this wildcard to the set of Status Variable names at the time the events are switched. If the boolean argument is set to false, no more events will be sent to the Event Admin service. The default state is sending events. The state of sending events must not be persistent, switching the events off must not be remembered between system restarts. A local administrator can create a monitoring job. A monitoring job consists of a set of Status Variables and reporting rules. According to these rules, the Monitor Admin service will send events to the Event Admin service. The same Status Variable can participate in any number of monitoring jobs. There are two types of monitoring jobs, each created with a different method. One is based on periodic measurements and one based on changes in the value of the Status Variable. The results of the measurements are sent to the Event Admin service, these events are described in Monitoring events. startScheduledJob(String,String,int,int) - Start a job based on a periodic measurement. Both the period of measurements as well as the number of measurements can be given. startJob(String,String,int) - Start a job based on notifications. The load on the Event Admin service can be minimized by specifying that only every n-th measurement must be reported. Status Variables used with this monitoring job must support notifications, otherwise an Illegal Argument Exception must be thrown. Both monitoring jobs take an identification String object as first argument. This identification is placed in the properties of the Event object under the key: listener.id. The initiator of the monitoring job should set this id to a unique value and so that it can discriminate the monitoring events that are related to his monitoring job. The second argument is a list of paths to Status Variables. The difference between the Time based monitoring and event based monitoring is further elucidated in Figure 119.5. Monitoring jobs can be started also remotely by a management server through Device Management Tree operations. The monitoring job therefore has a boolean method which tells whether it was started locally or remotely: isLocal(). A monitoring job is transient, it must not survive a system restart. A monitoring job can be explicitly stopped with the stop() method. For example, a bundle is interested in working with periodic samples of the com.acme.foo/memory.free Status Variable. It should therefore register an Event Handler with the correct topic and a filter on its Event Handler service. It then starts a monitoring job that is stopped in the BundleActivator stop method. After starting the job, the Monitor Admin queries the com.acme.foo/memory.free Status Variable every 15 seconds. 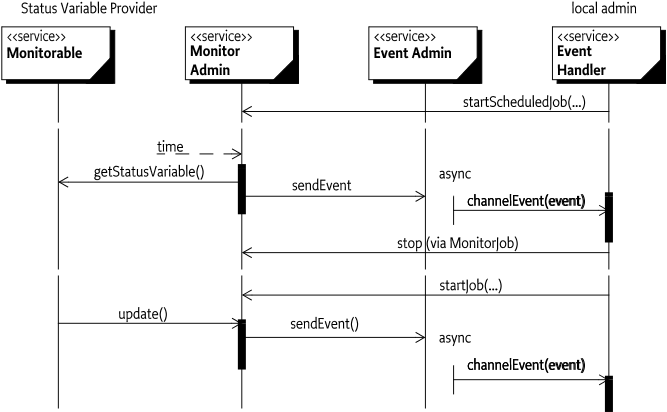 At each acquisition, the Monitor Admin sends a org/osgi/service/monitor event to the Event Admin service. The event properties contain the mon.listener.id set to foo.bar. The Event Admin service updates the Event Handler service that is registered by the example bundle. After receiving the event, the bundle can get the updated value of the Status Variable from the event properties. The events are therefore repeated once every 15 seconds until the bundle stops. The Status Variable was explicitly reset to its starting value with the resetStatusVariable(String) method. The Status Variable is queried from within a scheduled monitoring job by the Monitor Admin service. Event sending in the first two cases can be switched on and off, but in the case of monitoring jobs, it cannot be disabled. Monitoring events must be sent asynchronously. mon.monitorable.pid - (String) The unique identifier of the Monitorable service which the changed Status Variable. mon.statusvariable.name - (String) The name of the changed status variable. mon.listener.id - (String|String[ ]) Name or names representing the initiators of any monitoring jobs in which the Status Variable was included. Listeners can use this field for filtering, so that they receive only events related to their own jobs. If the event is fired because of a notification on the MonitorListener interface of the Monitor Admin service (and not because of an measurement taken within a monitoring job) then this property is absent. mon.statusvariable.value - (String) The value of the status variable in string format. The following methods must be used to format the String object. Registering Monitorable services, querying and resetting Status Variables and starting monitoring jobs requires a Monitor Permission. If the entity issuing the operation does not have this permission, a Security Exception must be thrown. READ -Reading of the value of the given Status Variables. RESET - Resetting the given Status Variables. PUBLISH - Publishing a Status Variable. This does not forbid the Status Variable Provider to register the Monitorable. However, the Monitor Admin must not show a Status Variables to any caller when the Status Variable Provider has no permission to publish that specific Status Variable. The n is the allowed minimal value of the schedule parameter of time based monitoring jobs. If n is not specified or zero then there is no lower limit for the minimum sampling interval specified. The purpose of the minimum sampling interval is to prevent the system from flooding. The target specifies the Status Variables that can be monitored. SWITCHEVENTS - Switch event sending on or off for the notification of value changes for the given Status Variables. The permissions must all be checked by the Monitor Admin. Further, the different actors must have the permissions as specified in the following table to operate correctly. Monitorable - A Monitorable can provide information about itself in the form of StatusVariables. MonitorAdmin - The MonitorAdmin service is a singleton service that handles StatusVariable query requests and measurement job control requests. MonitoringJob - A Monitoring Job is a request for scheduled or event based notifications on update of a set of StatusVariables. 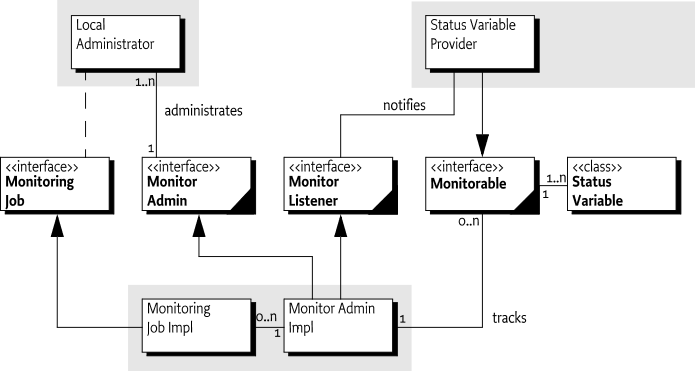 MonitorListener - The MonitorListener is used by Monitorable services to send notifications when a StatusVariable value is changed. MonitorPermission - Indicates the callers authority to publish, read or reset StatusVariables, to switch event sending on or off or to start monitoring jobs. StatusVariable - A StatusVariable object represents the value of a status variable taken with a certain collection method at a certain point of time. □ Returns a human readable description of a StatusVariable. This can be used by management systems on their GUI. The null return value is allowed if there is no description for the specified Status Variable. □ Returns the StatusVariable object addressed by its identifier. The StatusVariable will hold the value taken at the time of this method call. □ Returns the list of StatusVariable identifiers published by this Monitorable. A StatusVariable name is unique within the scope of a Monitorable. The array contains the elements in no particular order. The returned value must not be null. □ Tells whether the StatusVariable provider is able to send instant notifications when the given StatusVariable changes. If the Monitorable supports sending change updates it must notify the MonitorListener when the value of the StatusVariable changes. The Monitorable finds the MonitorListener service through the Service Registry. □ Issues a request to reset a given StatusVariable. Depending on the semantics of the actual Status Variable this call may or may not succeed: it makes sense to reset a counter to its starting value, but for example a StatusVariable of type String might not have a meaningful default value. Note that for numeric StatusVariables the starting value may not necessarily be 0. Resetting a StatusVariable must trigger a monitor event. □ Returns a human readable description of the given StatusVariable. The null value may be returned if there is no description for the given StatusVariable. □ Returns the names of the Monitorable services that are currently registered. The Monitorable instances are not accessible through the MonitorAdmin, so that requests to individual status variables can be filtered with respect to the publishing rights of the Monitorable and the reading rights of the caller. □ Returns the list of currently running MonitoringJobs. Jobs are only visible to callers that have the necessary permissions: to receive a Monitoring Job in the returned list, the caller must hold all permissions required for starting the job. This means that if the caller does not have MonitorPermission with the proper startjob action for all the Status Variables monitored by a job, then that job will be silently omitted from the results. □ Returns a StatusVariable addressed by its full path. The entity which queries a StatusVariable needs to hold MonitorPermission for the given target with the read action present. □ Issues a request to reset a given StatusVariable. Depending on the semantics of the StatusVariable this call may or may not succeed: it makes sense to reset a counter to its starting value, but e.g. a StatusVariable of type String might not have a meaningful default value. Note that for numeric StatusVariables the starting value may not necessarily be 0. Resetting a StatusVariable triggers a monitor event if the StatusVariable supports update notifications. □ Starts a change based MonitoringJob with the parameters provided. Monitoring events will be sent when the StatusVariables of this job are updated. All specified StatusVariables must exist when the job is started, and all must support update notifications. The initiator string is used in the mon.listener.id field of all events triggered by the job, to allow filtering the events based on the initiator. □ Starts a time based MonitoringJob with the parameters provided. Monitoring events will be sent according to the specified schedule. All specified StatusVariables must exist when the job is started. The initiator string is used in the mon.listener.id field of all events triggered by the job, to allow filtering the events based on the initiator. □ Switches event sending on or off for the specified StatusVariable s. When the MonitorAdmin is notified about a StatusVariable being updated it sends an event unless this feature is switched off. Note that events within a monitoring job can not be switched off. The event sending state of the StatusVariables must not be persistently stored. When a StatusVariable is registered for the first time in a framework session, its event sending state is set to ON by default. □ Returns the identifier of the principal who initiated the job. This is set at the time when MonitorAdmin.startJob method is called. This string holds the ServerID if the operation was initiated from a remote manager, or an arbitrary ID of the initiator entity in the local case (used for addressing notification events). □ Returns the number of times MonitorAdmin will query the StatusVariables (for time based jobs), or the number of changes of a StatusVariable between notifications (for change based jobs). Time based jobs with non-zero report count will take getReportCount()*getSchedule() time to finish. Time based jobs with 0 report count and change based jobs do not stop automatically, but all jobs can be stopped with the stop() method. □ Returns the delay (in seconds) between two samples. If this call returns N (greater than 0) then the MonitorAdmin queries each StatusVariable that belongs to this job every N seconds. The value 0 means that the job is not scheduled but event based: in this case instant notification on changes is requested (at every n-th change of the value, as specified by the report count parameter). □ Returns the list of StatusVariable names that are the targets of this measurement job. For time based jobs, the MonitorAdmin will iterate through this list and query all StatusVariables when its timer set by the job's frequency rate expires. □ Returns whether the job was started locally or remotely. Jobs started by the clients of this API are always local, remote jobs can only be started using the Device Management Tree. □ Returns whether the job is running. A job is running until it is explicitly stopped, or, in case of time based jobs with a finite report count, until the given number of measurements have been made. □ Stops a Monitoring Job. Note that a time based job can also stop automatically if the specified number of samples have been taken. □ Callback for notification of a StatusVariable change. 119.7.6.1 public static final String PUBLISH = "publish"
119.7.6.2 public static final String READ = "read"
119.7.6.3 public static final String RESET = "reset"
119.7.6.4 public static final String STARTJOB = "startjob"
119.7.6.5 public static final String SWITCHEVENTS = "switchevents"
□ Create a MonitorPermission object, specifying the target and actions. □ Determines the equality of two MonitorPermission objects. Two MonitorPermission objects are equal if their target strings are equal and the same set of actions are listed in their action strings. □ Get the action string associated with this permission. The actions are returned in the following order: read, reset, publish, startjob, switchevents. □ Create an integer hash of the object. The hash codes of MonitorPermissions p1 and p2 are the same if p1.equals(p2). □ Determines if the specified permission is implied by this permission. □ Constructor for a StatusVariable of int type. □ Constructor for a StatusVariable of float type. □ Constructor for a StatusVariable of boolean type. □ Constructor for a StatusVariable of String type. □ Compares the specified object with this StatusVariable. Two StatusVariable objects are considered equal if their full path, collection method and type are identical, and the data (selected by their type) is equal. □ Returns the StatusVariable value if its type is boolean. □ Returns the StatusVariable value if its type is float. □ Returns the ID of this StatusVariable. The ID is unique within the scope of a Monitorable. □ Returns the StatusVariable value if its type is int. □ Returns the StatusVariable value if its type is String. □ Returns the timestamp associated with the StatusVariable. The timestamp is stored when the StatusVariable instance is created, generally during the Monitorable.getStatusVariable(String) method call. □ Returns information on the data type of this StatusVariable. □ Returns the hash code value for this StatusVariable. The hash code is calculated based on the full path, collection method and value of the StatusVariable.